This word association riddle is inspired by the popular Word Association games like Chain Reaction. Here though is a GRID of words, in 3 columns (1 to 3) and 5 rows (4 to 8). 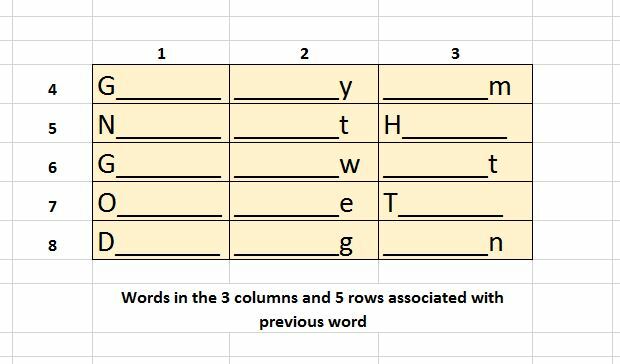 Words in columns are connected to the previous column word (column 2 words are associated with column 1 words in the same row and column 3 words are associated with column 2 words in the same row). Similarly row 2 words are associated with the row 1 words in the same column, row 3 words are associated in the row 2 words in the same column and so on. So the word grid has a horizontal -> and vertical downward association. The 2 associated words can be 2 separate words or can be combined for 1 word. For example, the 2 words can be First and Born which results into First-born. The words in column 1 start with those letters. The words in column 2 end with those letters. The words in column 3 alternatively end and start with those letters. These are not complicated words so to make it challenging I have not disclosed any starting or ending words. One clue: The last word (row 8 column 3) is a 4 letter word which can also be connected to the first word in column 1 row 4. Please let me know if more info is needed. Are any of these correct/which words are deficient? Since there are no rules other than 'words next to each other must create a phrase or a compound word' I feel like there are hundreds of possibilities that could fit, unless I'm missing something like "no adjectives" or "no really random and obscure references like the name of a book". To add difficulty I continued the trend across columns, so row1col3 wraps to row1col1. No repetition and no word-reversal (pie house vs. house pie) with the exception of the required word-reversal linking the beginning and end. Here's my take on it with some re-used words from other comments & answers. Here's my best guess so far, I don't love the last word in column 2, but everything else seems somewhat solid. But then again I can't count! Or read!